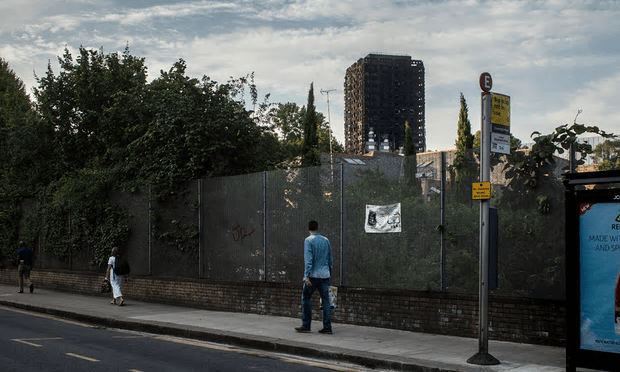 In the shadow of Grenfell: The blaze that gutted the tower will overshadow this part of London for a considerable period of time [Image: David Levene for the Guardian]. The government has put out a new press release in its latest attempt to reassure the former residents of Grenfell Tower – and the public at large. So it should be. But isn’t it significant that the government has to stress this fact at the top of a press release? Details that are not mentioned in the press release to the public. Something to hide, still? The council was forced to include this after stories appeared, saying attempts were being made to coerce people into moving out of Kensington and Chelsea – and in fact out of London altogether. Reasonable and practical according to whom, and under what criteria? An admission of a broken promise. Wasn’t it supposed to be within three weeks of the fire? Obviously this is after someone complained about having to do so. This is after reports appeared indicating that the former Grenfell residents were being asked to pay higher rent and service charges, simply because they were unfortunate enough to be involved in a massive fire that destroyed their homes and could have killed them. Why individually? Is it because residents always get the better of council officers in wider meetings? As you can see, this press release isn’t about rehousing the survivors of Grenfell. It is about trying to restore trust. It doesn’t succeed because it has to refer back to incidents that have eroded trust. In this video, new Kensington MP Emma Dent Coad accuses the council of incompetence – and what about the statement from contractors Rydon – who put the flammable cladding on the walls of Grenfell, that turned it into an inferno? They said they had removed all information about the tower from their website “as a mark of respect”. All of these mis-steps, by the council and the minority Tory government that is backing it, mean trust in our elected representatives is being eroded. And that’s dangerous – not just for the government, but for society in general. Our civilisation runs on trust. We trust businesses to sell products that work; we trust local, regional and national government to safeguard our interests. Without that trust, we won’t support those businesses with our money; we’ll call on the elected representatives who failed us to step down – and if they refuse to do so, we’ll take further action that risks a breakdown of society as we know it. Matters can escalate very quickly, even here in the United Kingdom. That’s why the Tories are trying to restore trust. But they’re trying in a very lacklustre, half-hearted way. They are concentrating on what they think they should say to make us all feel better, rather than what they should do. And remember: They would not have lifted a finger for these people without the massive public support for them that has continued to push the mass media into covering their struggle for justice. That’s not good enough either. If these people need to be pushed into doing the right thing, then they’re not the right people for the job – in local or national government. So basically they are saying if you were living in Grenfel tower and we knew about it you will not have to pay any difference in rent for your new home, but if you were not in that group, i.e. sublet or just living with someone else you will be expected to pay the going rate, sounds fair to me. That’s not the point and you know it. They’re backtracking on previous situations in which Grenfell survivors would have been expected to pay more. They’re also backtracking on their promise to rehouse Grenfell survivors within three weeks of the fire (because, let’s face it, they haven’t managed it). Nobody mentioned subletters apart from you. Why did you do that? What were you hoping to achieve? How can we get rid of the MPs who are in charge of all this? Street protests? Petitions? All of us emailing our concerns to our MPs? If a revolution is required, then we had better start it soon, before things get any worse in this country. The general apathy towards what the government is doing is incredibly worrying, do the public really not care unless it affects them? I sometimes feel ashamed to live in this country. Just got quite excited. The radio news started talking about a new law reducing the risk from drones. I thought they meant these execrable Tory councillors or at least the hereditary rump in the House of Lords. Imagine my disappointment on discovering they meant those horrible buzzy things that upset my dogs when we’re out for a walk.